Being one of the busiest joints on our bodies, our knees take a lot of stress with our daily routines. We jump, walk, lift, and squat constantly, which can lead to inflammation. This tends to cause the pain we feel in these important joints. Our first thought is to turn to over the counter medicines to get rid of the pain, but they are temporary and can only be used in certain amounts. Many natural oils not only relieve the inflammation in aching joints but can kill the pain as well. These oils can be the natural remedy you are looking for. Peppermint has long been used to soothe upset stomachs. It also contains menthol, which has an analgesic component to relieve pain after topical application. This oil has an anti-spasmodic effect that can help to relax muscles that have become tense from the pain. (1) You can rub it directly onto the skin where the pain is located for a cooling sensation as the analgesic begins working. This oil seems to work well when mixed with other plant-based oils with the same properties. Always mix the 1-2 drops of the oil with a carrier oil to prevent skin reactions as peppermint is very concentrated. Ginger has many properties that make it an excellent choice for relieving knee pain. Most joint pain can be traced to an inflamed joint. Inflammation is a sign that something is wrong within the body or there has been some injury and redness, swelling, and pain is the body’s response. (2) Though this is a natural response, it is sometimes an acute or chronic condition. Oils like ginger have an anti-inflammatory property which has been shown to reduce the symptoms and so reduce the pain caused by these health issues. (3) This is true if it is topically applied as oil and even with the lessened effect if ingested as a powder. This particular oil would be recognized by many just for its ancient and famous name. Myrrh is a resin which comes from different types of trees and can be used for many purposes. It is widely used in religious ceremonies for its potent aroma. Along with another common tree resin, frankincense, it is considered valuable because of its usefulness as a pain killer and has been shown to reduce inflammation in painful joints as well. (6, 7) It can be ingested but may cause some stomach upset so topical application may be the route to take. Be sure to mix myrrh with a carrier oil, about 1-2 drops per tablespoon to prevent a skin reaction. This oil is found in hundreds of different products from bath soaps to air fresheners. The aroma has been found to soothe and relax, but the oil also has useful pain relieving properties that make it worthwhile for direct application to the body. (8) It is an anti-inflammatory so it works to remove the source of the pain, that is, your body’s automatic response to injury. It also calms any muscles which may be twitching, as it acts as an anti-convulsant as well. (9) The relaxing effect may even reduce your pain that its scent is known to have. How many times have you been able to remember how to lift something properly before your knees twinge in protest? You’re in a hurry to get into the house with those heavy bags of groceries and herding the children along the way. I always squat too deep, or not deep enough, or twist too fast. Stairs and I have agreed to disagree with each other. Being a runner hasn’t done any favors for my knees either and the muscles in my legs being tight only contributes to my pain. Peppermint oil is my first choice when it comes to my joint pain. I must admit that being reminded of candy canes and holidays is undoubtedly a definite perk as well. I mix a few drops with a couple tablespoons of sweet almond as my carrier oil. I can rub it directly on my sore knees which have been used all day, enjoying the wonderful cooling sensation of menthol. It almost reminds you of ice as it seeps into your skin and the pain is soothed away. I apply to the sides of my knee and the backs of my legs for those tight muscles that make the pain even worse. I also love lavender. Lotions, candles, and soaps. One of the best ways to relax after a run and calm those hot, overworked muscles is to add some lavender oil to my bath. The relaxing aroma certainly helps along with those anti-inflammatory properties. If anything is twitching or twinging in protest, the lavender calms that as well. Where I find peppermint to be slightly invigorating, lavender seems to elicit a more peaceful sensation and calms my entire body, not just the knees. And if I can manage it just before bed, even better. Looking to have a mix of the best natural remedies for all those symptoms that cause joint pain? This balm includes the anti-inflammatory effects of ginger and frankincense right alongside the pain-relieving menthol cool of peppermint. 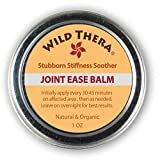 This balm features several oils, all known for their effects on joint pain. You wouldn’t have to worry about mixing your oils properly either. They are ready for application in a skin-friendly base of olive oil and beeswax. And being all natural, you don’t have the side effects you find with regular joint pain creams and medications. You can apply this to any joint on your body, multiple times a day for the relief you need. While oils using alone can be effective, using a mix of natural remedies can be the best way to get what you’re looking for in a pain relieving cream. This cream combines natural ingredients to reduce inflammation, calm tense muscles, and take away the pain. Glucosamine and frankincense (the cousin to myrrh mentioned above) to focus on the inflammation response in your joints that causes pain. Peppermint oil gives that cooling effect that helps take the pain away without using pills. It’s formulated to be applied directly to the skin and can be used more often than over the counter medications. Did you enjoy learning about natural remedies available to relieve your joint pain? I love that I can use these oils and creams as often as I need to without the same kind of effects I would get from using over the counter medications. With all the ways I use my knees during the day, it’s useful to have a remedy that can be used at any time. Be sure to comment with your experiences and share this article to spread the word about the pain relief you can find with these natural oils.